The Claim feature can be used to update the information associated with your email in Hunter or permanently remove it. How can I update my information in Hunter? Go to the claim section in Hunter and simply enter your email (the email needs to be listed in Hunter). An email will be sent to the email address you claimed to verify your identity. Click the "Claim this email address" button to access the claiming page. The information submitted will be reviewed and updated in two weeks maximum. 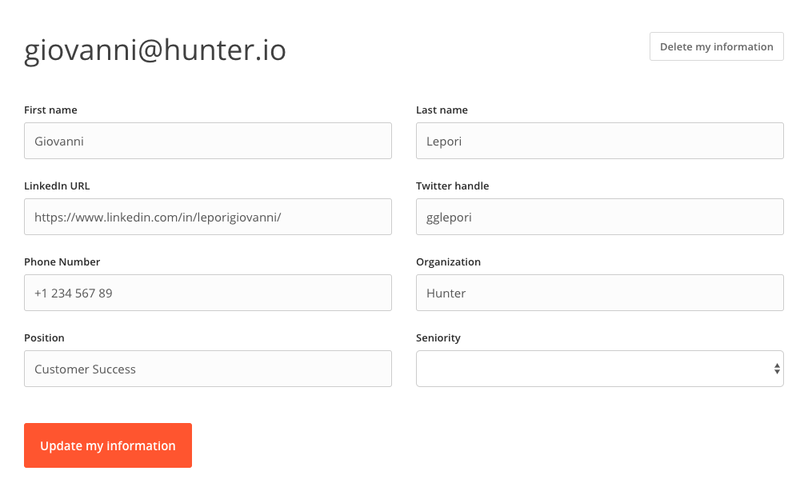 How can I remove my email and data from Hunter? Simply follow the same procedure listed above and, click the "Delete my information" button on the claiming page. We will remove your email and all the associated information within two weeks.